If I tell you that Bihar could be the next destination which would change the way you think then maybe you respond to me as the Biharis say, “E ka keh rahe ho, bhakuaana hue ho ka ekdum?” But this can be only said by people who don’t know that this cosmic state hitched with many tags. While few relate with the unique dialect and the scrumptious Bihari cuisines like LittiChokha, Sattu etc and others know it for the Gautam Buddha’s nirvana town Bodhgaya. You would be surprised to know that the concept of democracy started here and Vaishali city is among the first republics of the world. Whoo! The palms of Bihar don’t stop here, while everyone is falling for foreign accreditation today, this state is bejewelled with Nalanda University where every scholar around the world desired to complete their higher studies. Yes, the same university which your father had sung accolades about. Not knowing about the marvel of ancient India, Nalanda University, would be such a felony so let’s gloat over the golden past and dig the history buried in oblivion. If somebody asks you to date Ashrams and Gurukuls you would feel bizarre because they have been ubiquitous in every era, epics and Puranas. But since the modern era loves orchestrating every fact, Nalanda University is known to be the oldest university in the world after Takshila. 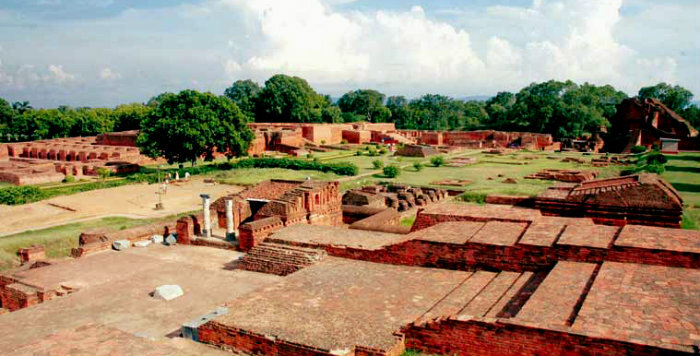 Nalanda University became the first residential University of the world apprising the layout of modern-day universities before they were even thought about. Would you believe that it was founded in 5th Century by Shakraditya Kumar Gupta I of Gupta Empire? Though the development of university was continued by his heirs and further patronized by Harshavardhan from Kannauj in 7th Century, still, it seems unbelievable seeing the synchronized structural design. Merely 95 Kilometers from Patna, even the ruins of Nalanda University can leave you agape with its grandeur and meticulous architecture. While you stroll through the old passages of red bricks of Nalanda University consider yourself lucky to see this marvel of ancient India, else, when it was functioning even for entering the gate you were required to answer the conundrums. Just imagine only two out of ten students were able to answer them. But all that brainstorming seems petite against the learning given in the Institute as knowledge was the only constraint. You would not believe but everything in Nalanda University was free, maybe that is why we still say, Incredible India. I believe this university lived up its name which meant giver of knowledge. It is said that the institute was bequeathed by the knowledge stream of prodigies like Gautam Buddha and Aryabhatta. I now wonder that could any university of the world till date could stand against Nalanda University? From the ancient texts discovered, Nalanda University had 108 units which included a hall, 30 rooms, bathrooms and a well each. OMG! You would feel that I am boasting but even at that time each room had bookshelves, a kind of locker facility where students could keep their belongings and single or double bed availability. Then, when you see the long furnaces you will be surely bewildered about their use. Yes, normally one may assume that they were used to cook food but since it was Nalanda University, the marvel of Ancient India, it is also believed that they were part of huge laboratories. (#ICYMI I used word laboratory for a university that existed around 1600 years before) Seeing the row of temples at first you would be awed by the architecture, sculpting and terracotta figurines designing then you would realize your mother was right, spiritual enlightening is crucial. Accounts of Chinese travellers Xuanzang and Yijing who are known to have visited and resided in Nalanda University during the 6th Century recite lauds about the place. It is said that this learning seat had around 10000 students and 2000 teachers who dealt in subjects covering every field like Literature, Logic, Metaphysics, Anatomy, Economics, Astronomy, Ayurveda, Mathematics, Surgery, Yoga-Shastra, the Vedas and many others. I don’t know whether other parts of the world even knew about these subjects so early (#Pure Exult). They even sing eulogies about the great library of Nalanda University which was named as Dharmaganja, meaning the treasury of truth. It comprised of three buildings Ratnasagar, Ratnaranjaka and Ratnodhadhi, out of which one was 9-storey building. They comprised 9 million books which had many handwritten books in pandulipi and many other ancient forms. Phew! From this huge archive, many Chinese travellers had taken volumes of books with them. Even Xuanzang and Yijing had returned to China with thousands of books and ancient texts from the Nalanda University. I don’t know why this fact still gives strange palpitations as if I could stop my heritage from going out. After 800 years of successful functioning, Nalanda University was vandalized by an army of the Mamluk Dynasty under the leadership of the barbarous Bakhtiyar Khilji in 12th Century. The ruthless insanity of Khilji was such that not only he plundered the University but burnt the residents alive. Adding on to the atrocity, his army even didn’t spare the precious library of Nalanda University and the rare ancient books and manuscripts were set on fire. You know the library kept on burning for several months continuously. Now just imagine the volumes of books! It is painful to even think about it, a real facepalm event.